Mysuru: The Karnataka Police is becoming more people-friendly. Even though the khaki uniform, heavy shoes, caps, lathis, rifles or the guns they use have not changed much, one change we do notice among the personnel and the officers is their behaviour towards the public. The change could be because, unlike in the past where people with hardly any qualifications used to join the force, the scenario has gone a sea change with many of them with degree and postgraduate degrees joining the Dept. There was a time when the very word ‘Police’ sent the shiver down the spine of the people and their very presence would make one feel guilty even though one had not ever indulged in any anti-social activity or in crime. But now, we are slowly coming to understand that they also have a heart and emotions. The change is visible with ‘People-Friendly Police Stations’ as a first step. It is quite a pleasant surprise to see the moment one enters a Police Station, there is a friendly woman receptionist welcoming you and enquiring about your problems. She offers a seat and the moment the Inspector or the Sub-Inspector is free, she ushers the person into the chambers. There is also the ‘Abhaya’ scheme with the assurance to the lonely elders that,‘We are with you all the time.’ ‘Vanita’ Helpline for Women, Children’s Helpline for the protection of the child and ‘Pink Hoysala’ are a few of the reforms brought about by the Mysuru City Police. Going a step forward, the City Traffic Police is coming out with a logo ‘Namma Mytra’ with the tag line ‘Ondagi yellaru kattona nammoru – Subhadhra Mysuru’ (Let us together build our city – a safe Mysuru). This logo has a cute elephant face, a Police hat, white shirt with two pockets, khaki pant and red shoes with the hands folded at the back (partly seen). The logo attracts everyone from child to grown ups. The Traffic Police will sport the logo badge on their uniform and discharge their duties. If a situation arises that they lose their cool while controlling the traffic, then the logo will remind them, ‘Nanu nimma mitra, neevu namma mitraru’ (I am your friend, you are my friends). It is with this idea that this logo is designed and the scheme going to be implemented. The Mysuru City Police will launch the logo ‘Namma Mytra’ with the tag line next week. 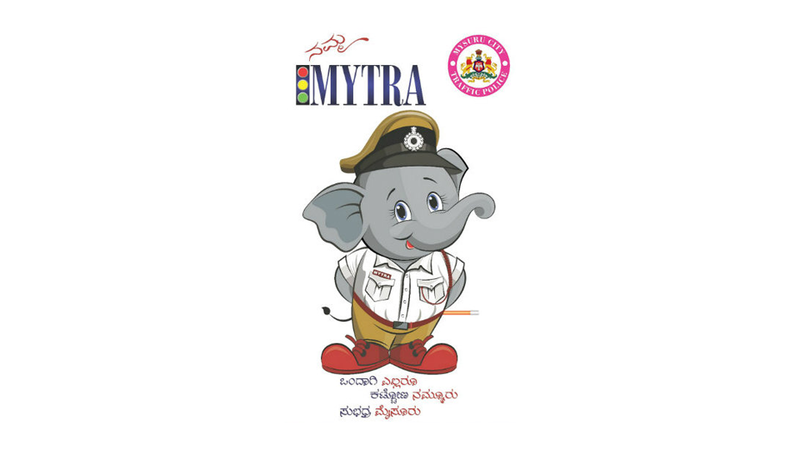 The inspiration behind the launch of the ‘Namma Mytra’ logo is the Traffic Head Constable Meese Thimmaiah in Bengaluru, said Police Commissioner Dr. A.S. Subramanyeswara Rao. “When I was a boy, I had observed Meese Thimmaiah controlling traffic every day near General Post Office Circle close to Cubbon Park opposite Vidhana Soudha. He was working with a lot of energy and enthusiasm all the 365 days,” he said speaking to SOM. One day, a vehicle came knocked him down and he was killed. Because of his commitment, discipline and time sense, the Police had introduced ‘Namma Mytra’ logo carrying Meese Thimmaiah’s photo. However, his family members had objected and hence the logo design was dropped, he further added. Ever since Meese Thimmaiah’s inspiration had stayed in my mind. We also wanted to project the Traffic Police as friendly and gain the confidence of the people. We are releasing the logo ‘Namma Mytra’ with the tag line next week, said Dr. Rao.